Description: An elegant design statement created for any room, the Metro collection highlights a Beige Iridescent Glass diffuser which is achieved with hot high-fired glass that is transformed into a cool abstract lighting design. 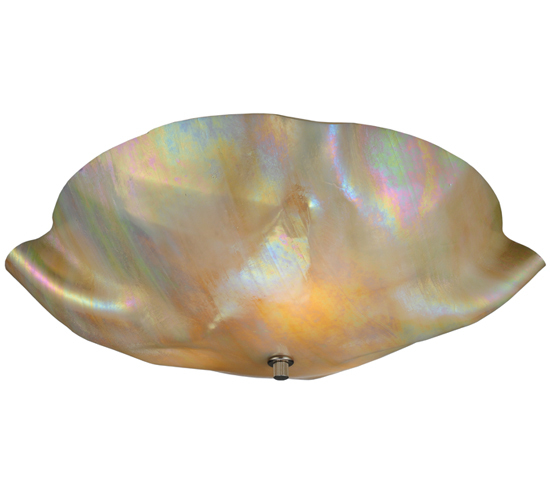 The ceiling fixture, which is complemented with a Nickel finished bottom finial, is ideal for foyers, corridors and other interiors in homes, resorts, hotels and restaurants. Custom crafted in the USA. Custom sizes, styles and colors are available, as well as dimmable energy efficient lamping options such as LED. The 16-inch wide fixture is UL and cUL listed for dry and damp locations.